Earn 129 SATVantage Rewards points with this purchase! The Openbox S9 is a high definition FTA satellite receiver that supports both DVB-S and DVB-S2 protocols along with both QPSK and 8PSK modulations. It features a quick and accurate hardware-driven Blind Scan and AC3 audio decoding to the analog audio output jacks. 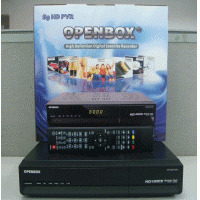 The Openbox S9 HD is also PVR ready to record your favourite programs or for time-shifting when an external hard drive is connected to the unit (not included). Power supply is compatible with either American or European voltage standards. Bit rate 115,2 kBit/s max.